Following Elizabeth's (Don't Call Me Betsy) lead, I am putting down my 2011 quilting goals. Hold me to this, alright? 1. Finish all the quilts I started in 2010. I'll have to tell you about my new besty that will help me accomplish this! I have backs for all of these, just need to get to work! 2. My Bees! I'm in 2 VQBs - Fresh & Funky and Lovely Linen. March is my month for Fresh & Funky and I keep wavering on what I want the ladies to make, but for now I'm leaning toward confetti. My month is February for Lovely Linen and I know what I want the blocks to look like! I'm also a Hive Caretaker over at 3x6. 3. Swaps. I'm signed up for M3 (Make Mine Modern, formerly Modern Swappers) and Spice up the Kitchen. I'd also love to do another round of the Pillow Talk Swap and get in on Scrappy Mug Rug Swap. 4. More quilts! I have 2 baby quilts lined up for January/February (babies due in March & April). 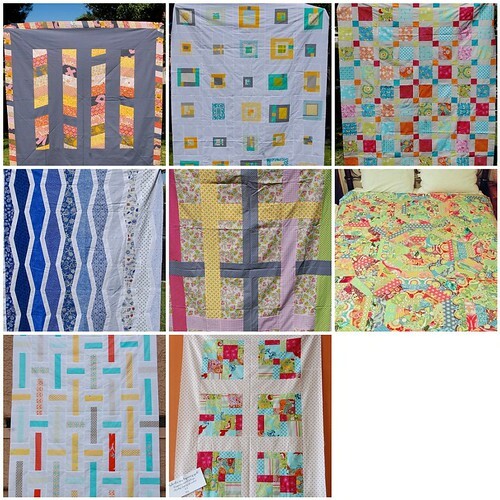 Plus there are TONS of quilts I want to try. Josh, Good job holding the quilts. Ohhhhh I have so many UFO's sitting in Narnia, too many .. .. ..
love all of those quilts you started! i should post my list, too. i have a pretty hefty list, plus, i just added a block of the month thing....now i just need more time in the day!